Kaveri was officially released on January 5 with the products shipping on 14th of the same month. However only the A10-7850k, A10-7700k and in some cases the A8-7600 were released. We have just received information that the second wave of the Kaveri APU will debut in Q2 2014. A10-7800, A6-7400k , A4-7300 to Debut in Second Quarter of This Year. As you can see a higher end but low power Quad Core APU is included with 2 Dual Core APUs. The 4 Cores A10-7800 is a locked Kaveri APU with R7 Radeon, 4 MB of L2 Cache and 512 Cores (same as its high end counterparts). However TDP is lowered to 65W instead of 95W while memory freq remains at 2133 Mhz (though there is word in the air that this will be pushed up to 2400 Mhz before long). The Dual Cores (A6-7400k and A4-7300) are APUs aimed towards the heart of HTPC market. Building a casual HTPC or even a HTPC/NAS hybrid? 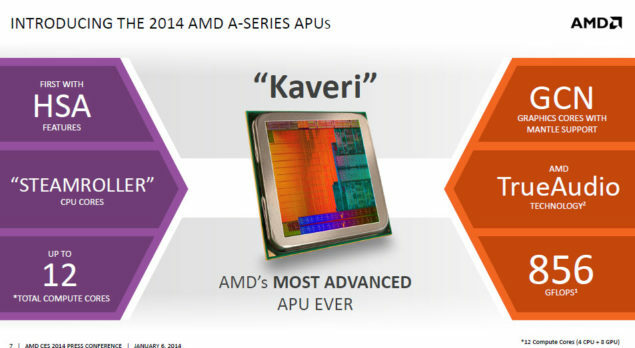 Then these Kaveri Dual Cores are perfect for you. Radeon Cores have been lowered to 256 and 192 respectively and cache to 2 MB. Both feature the Radeon R3 Series and have a TDP of 65W. One of them (A6-7400k) is unlocked while the other is not. However the thing i am interested in is that Richland has not been phased out of inventories completely yet, introducing these lower end versions so soon might actually prove detrimental to their sales.